All 4Schools user permissions are managed via the user's account in the Users Database. From within the Users Database, use the Search/Manage option to find the desired user account. Select the edit pencil next to the user to access the user's account. 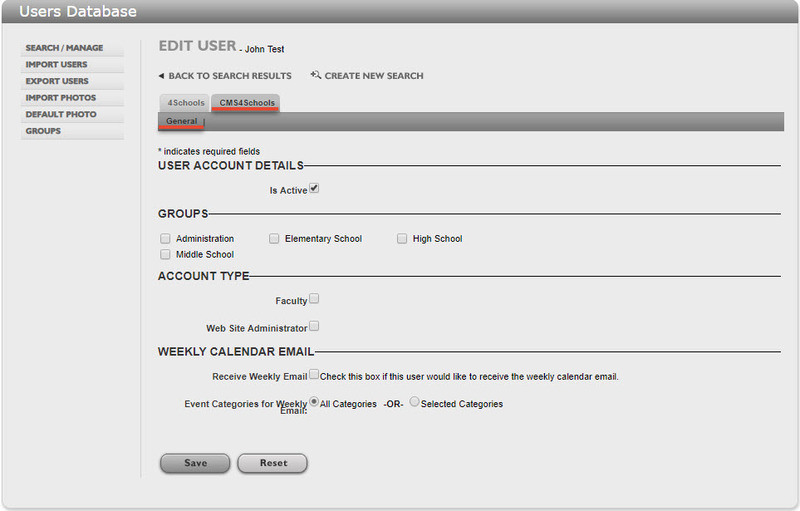 Once in the Edit User screen, select the Calendar4Schools tab to start adding/editing permissions. Admin: Gives access to read/write to all calendars. User: Access to all calendars or only those selected as determined within the listing of calendar categories/subcategories. Note: Each calendar category can be given one of four options; None, Read, Read/Write, Defer to Sub-categories. Announcements to the Cal4Schools Welcome window. Public Users Database: Even though the Public Users Database is currently only being used within the Calendar4Schools application, this permission is set in the 4Schools Permissions tab. Calendar4Schools Support Center: Individuals given access to any of the support centers should be the ones who support and troubleshoot the application for the majority of the district’s users.